SKY MAP: The sky as seen at 10 pm local time on July 1 from midnorthern latitudes. Eveningskywatchers are still enjoying the sight of at least three of the five brightnaked-eye planets: Venus and Saturn in the western sky and Jupiter, low in thesoutheast. And if you really stay up late – say after 1:30 a.m. local daylighttime – you can add a fourth planet, Mars, emerging from above the easternhorizon and which will become increasingly prominent during the summer and fallas it slowly approaches the Earth. But this weekend really belongs to Venus and Saturn, both easily visible in the western sky just as darkness falls. The twoplanets will put on a show on both Saturday and Sunday evenings when they willappear within 0.8-degrees of each other. The actualmoment of closest approach will occur at 09:33 Universal Time on Sunday, whenthey will appear to close to within 0.66-degrees of each other. How close isthat? The apparent width of the Moon is equal to one-half degree, and the widthof your fist held at arm's length is roughly equal to 10 degrees. Unfortunately,the two planets will be below the horizon at that hour for North America, while Europe will be in daylight. It will be around sundown for Japan and Australia, however, where a good view of the closest approach between the two planets canbe seen. The twoplanets will then slowly pull away from each other during the rest of July. On Fridayevening, June 29, dazzling Venus willbe below and to Saturn'sright. Saturday evening, Venus will appear directly underneath Saturn. 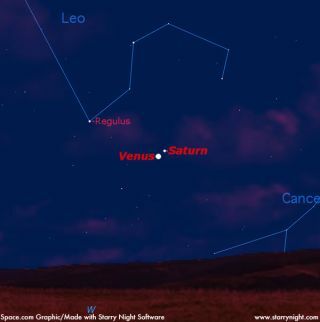 ComeSunday evening (July 1), Venus will have shifted to the lower left of Saturn. ByTuesday, July 3rd, the gap between the two planets will have widenednoticeably, but now they'll be side-by-side, with Venus on the left, Saturn onthe right. Venus has been a prominent evening object since January,will finally relinquish the title of "Evening Star" by the start ofAugust, so July will be your last full month to enjoy it during convenientevening hours before it makes the transition to the morning sky. On the 8th, Venus attains its greatest brilliancy and blazesat an eye-popping magnitude of -4.5. But compared to just a week earlier itwill be noticeably lower in the sky at sundown and setting just 2 hours later.On the evening of the 12th, Venus will pass less than 2-degrees below Regulus,the brightest star in the constellation Leo; you may, however, need binocularsto see the star. By the end of July, Venus will be setting only 45 minutesafter sunset; you'll need a clear and unobstructed horizon to spot it. A fewmore days into August and it will finally be gone from our evening sky. It willsweep between Earth and the Sun (inferior conjunction) on Aug. 18, then, just aweek later it will emerge into view as a morning object, rising in the eastabout 45 minutes before sunrise. By the end of August, Venus will be rising around 5 a.m.local daylight time, ultimately becoming a brilliant predawn fixture in theeastern sky for the balance of the year. If you have a telescope or even7-power binoculars (held steadily or mounted on a tripod) you'll see Venus willappear as a beautiful crescent phase all during July and again late in August. Saturn begins July hovering just above and to the right ofdazzling Venus, and in fact, follows Venus' plunge into the sunset fires as themonth progresses. Saturn is shining at a very respectable magnitude of +0.6,but unfortunately this pales to the brilliance of Venus. Indeed, Saturn onlyappears one-hundredth as bright! Currently located in the constellation of Leo,Saturn's famous ring system is now tipped about 14-degrees toward Earth andstill provides a spectacular view even in small telescopes. Made up by billions of ice and rock particles of all sizes –from small debris to boulders as big as houses – these rings orbit Saturn atvarying speeds. There are hundreds of these rings, believed to be pieces ofshattered comets, asteroids or moons that broke apart before they reached theplanet. The rings are so big that they would fill most of the distance betweenEarth and the Moon. Speaking of the Moon, a lovely crescent will appear to hoverjust below and to the left of Saturn on July 16. On the next evening it willhave moved well off to the east, past Venus. One final point: if you compare Venus and Saturn with atelescope, you'll be struck by how much more dazzling Venus appears in lustercompared to the mellow yellow of Saturn.